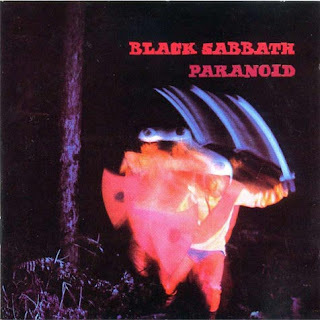 An album recorded and rushed into the hands of the eager public just four months after the debut of Black Sabbath signaled the start of a new music era, Paranoid is famous as the mainstream breakout album for Black Sabbath, but it is not as good as its fame suggests. The song Paranoid, a quickie written in a matter of minutes to pad the album, became an unlikely singles chart hit. It is a serviceable song, but it's difficult to get too excited about the monotone, simplistic riff and journeyman solo. The real gold on Paranoid resides with two epics, the anti-war anthem War Pigs, and the apocalyptic Iron Man. Both are all-time metal classics, dense, unstoppable, and wielding enough packed power to pulverize massive structures. On both tracks Iommi's riffs just dominate with a rare, hypnotic intensity, and the band follows in his wicked slipstream. Rat Salad provides welcome energy, but the rest of the material on Paranoid comes across as rushed and lacking the sharp edge of inspiration. Planet Caravan, Electric Funeral, Hand Of Doom and album closer Jack The Stripper / Fairies Wear Boots all stray into slowly-getting-stoned territory, with plodding speeds inadequately substituting for limited substance. Paranoid catapulted Black Sabbath to the top of the charts, and despite no radio play, it announced to the world that something called heavy metal is here to stay. In that respect, it's cultural value is more important than the patchy quality of its content. Engineered by Tom "Tony" Allom and Brian Humphries.